The perfect Ihram Set specially designed for women to perform Hajj and Umrah. This set consist of one plain white Jubah and a white Mini Telekung. As the Jubah is designed with loose cutting, it will fit the wearer nicely but not too tightly. This will allow the wearer to move and performing ibadah easily and comfortable. We also made the Telekung with stretchable chin cover that will fit the wearer face nicely without too worry the messy hair. And plus the cute small lace for a soft touch. Made from comfortable premium cotton which is suitable to wear during hot and cold weather. The material is easy to wash and iron. And most importantly it is not transparent. Ihram Set for women is the perfect ihram for you! Telekung face is easily shaped around the face. Telekung chin cover made from stretchable material. Jubah is come with one side pocket. Jubah is made with front zipper and nursing friendly. Jubah with stretchable rubber grip on the sleeves. 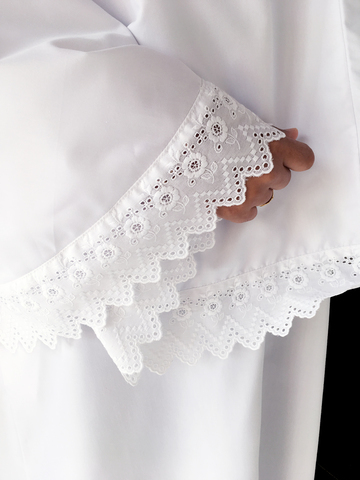 Round collar on the Jubah.